Anthony J. Albanese (The American University, 1996) was elected International Secretary at the 2018 St. Louis Karnea. Albanese’s volunteer service began in 2005 when he was appointed advisor to the Beta Lambda Chapter at Lehigh University, a position that he held for six years. In 2008, he took on the additional responsibility of serving as an Eastern Division vice president for the Omega, Theta Chi, and Theta Tau Chapters. 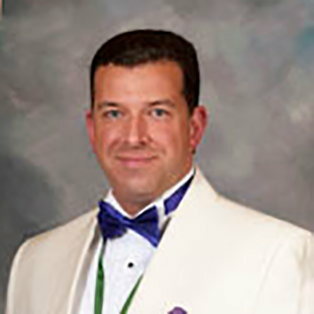 In 2011, Albanese was elected as the 50th Eastern Division president and was reelected in 2013. During his four years in office, the Eastern Division grew from 24 to 29 chapters and colonies and from 952 to 1566 men. Ever committed to representing the men of his division, Brother Albanese drove more than 34,000 miles visiting his chapters while serving as Division President. In 2015, Brother Albanese became the advisor for the Iota Pi Chapter at the University of Vermont, a chapter for which he became an honorary initiate in 2014. After completing this one-year commitment, he then served as the advisor for the Kappa Gamma Chapter at Monmouth University. In 2017, he was appointed division vice president for the three chapters in New Jersey: Rho, Kappa Gamma and Kappa Epsilon. Brother Albanese has served on two separate housing corporations, as a member of the Fraternity’s Sesquicentennial Commission, and on numerous committees. He currently serves at the Chairman of the Delta Tau Delta Bethany Founders’ House Committee. He has attended twenty division conferences, nine Karneas, as well as three leadership academies. As an undergraduate, Albanese served as president and vice president of the Theta Epsilon Chapter. He also served as IFC president, IFC vice president and IFC Greek Week chairman. Albanese has been recognized for his volunteer service to Delta Tau Delta in numerous ways, including Theta Epsilon Alumnus of the Year, Eastern Division Chapter Advisor of the Year, Member of the Heritage Society, Member of the Bethany Society and a recipient of the William J. Fraering Award. In 2016, he was the 445th individual to be cited into the Fraternity’s Distinguished Service Chapter. Professionally, Albanese is the owner of Alman Group, LLC. A registered lobbyist in New Jersey, Albanese interacts with officials at all levels of government in the State to further the interests of the firm’s wide variety of clients. Albanese and his wife, Debbie, reside in central New Jersey with their three rescue dogs.